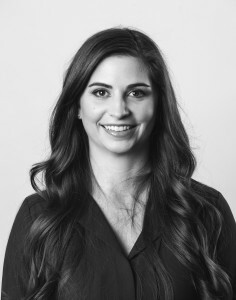 A true West Coast girl, Blaire Ritter brings nine years of restaurant, hospitality, beauty and lifestyle public relations and marketing communications experience to her role as account director at one7 communications. As an executive in the company, she is responsible for overseeing account teams and managing client relationships, along with developing, administering and implementing innovative public relations, marketing communications and digital influencer programs. Ritter also spearheads the one7 communications comprehensive internship program. Her strong industry knowledge, work ethic, responsiveness to clients and media and creative story-telling skills allow her to deliver solid results for clients, including Emeril’s New Orleans Fish House, Rogue eSports, Trump International Hotel Las Vegas, The Spa at Trump, DJT Restaurant, Evel Pie, Daily Kitchen, Lobster ME, PANDORA Jewelry, Professional Beauty Association, Cosmoprof North America, Beauty Collection, DePasquale the Spa, The Golden Tiki and Jaburritos. She has successfully secured placement for clients in publications including Beauty Launchpad, Modern Salon, Men’s Journal, WWD, Orbitz, USA Today, Las Vegas Magazine, Vegas Seven, Vegas Magazine, Vegas Rated, FoodNetwork.com, LA Times, Redbook, the Las Vegas Review-Journal, Livingly.com, FOX 5, and KTNV, amongst several others. Ritter was born and raised in Los Angeles and moved to Spokane, Wash. to attend Gonzaga University. Upon graduating, she moved to Las Vegas to pursue a Masters in Journalism and Media Studies at UNLV. While there, Ritter taught journalism to incoming freshmen, was managing editor of the student newspaper, The Rebel Yell, and started working with a boutique PR firm, focusing on beauty and lifestyle brands. Ritter is an avid Gonzaga Bulldogs fan, animal lover and ‘90s boy band aficionado. She loves to read, cook and travel in her spare time.